Just Julie B's Stampin' Space: Father's Day is Coming! I made this card today for my hubby for Father's Day. 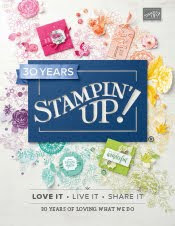 I used some inspiration for the coloring and the layout from a couple different people on Stampin' Connection (thank goodness for others' creativity when mine isn't always flowing!). The coloring looks a little washed out in the photo, but it does look clearer in person. And, if I had to make again, I would have used the Watercolor Paper (it does make a difference!). I even made a coordinating inside for the card. I noticed that a lot of people are doing this now. And, especially on the darker color base, it is nice to have a white writing surface for the inside. PS The set is King of the Grill from the Summer Mini!